In footballing circles, the term Anschluss Match generally refers to one of the most shameful moments in the history of the World Cup. Algeria, debutantes at the 1982 World Cup, shocked the world with a 2-1 victory over West Germany in their opening match. Only a West Germany victory over Austria by a one or two goal margin would see Algeria eliminated in the final match of the group. And that’s exactly what happened. After Horst Hrubesch gave the Germans a 1-0 lead early on at the El Molinón Stadium in Gijón, both teams effectively stopped playing, content with the result. The West German commentator lamented “What is happening here is disgraceful and has nothing to do with football.” The match ended 1-0, and Algeria were out. Spanish newspapers denounced the match as “El Anschluss,” a reference to the unification of Germany and Austria in 1938. In Algeria it is still known as by this name. But forty four years prior to the Anschluss match in Gijón, the actual Anschluss occurred. Anschluss is a German term whose literal definition is ‘connection,’ but its political connotation exclusively refers to Nazi Germany’s annexation of Austria in 1938. The idea of unifying all the German peoples into one state was not a new one. German nationalists throughout the 19th century argued for such a state, but Otto von Bismarck, the architect of German unification, opted for a Prussia-dominated “Little Germany” solution that excluded Austria and its vast Central European lands. But the belief that Austria and Germany should be united never died out and became fashionable once again in the interwar years. Though unification of Germany and Austria was explicitly prohibited under the terms of the Treaty of Versailles, the reaction to Hitler’s increasingly assertive foreign policy was meek and non-confrontational. The proponents of appeasement, the diplomatic trend of the day, asserted that by making concessions and avoiding conflict, Hitler’s territorial ambitions would eventually be satisfied. Therefore the reaction to the Anschluss did not exceed a mild rebuke from the international community. In celebration of the long-awaited unification, the German and Austrian authorities, recognizing the popular appeal of football, planned a friendly match between the two national teams. What was supposed to be a celebratory draw turned into an unexpected victory for the Austrians and an outpouring of Austrian nationalism. One player, Mathias Sindelar, the magician at the heart of the Austrian Wunderteam of the 1930s, stood out in his resistance to the Nazification of Austria and its national team. His performance in the Anschluss match and his refusal to play for the combined German national team made him an icon of Austrian defiance, and his untimely death made him a martyr of Austrian football. The story of the Anschluss Match and the defiance of Sinderlar is one that deserves to be remembered, for it serves as yet another reminder of how football transcends the boundaries of the pitch and takes on a mythical narrative of its own. Football first made its mark in Austria in the Styrian city of Graz, where it was introduced by a medical student named Georg August Wagner who had been “infected by the football bacillus” in his native Prague, where the sport had already attained a modest level of popularity. Wagner organized the first football match in present day Austria in 1894 and quickly became a popular pastime amongst the city’s students. While the game was first incorporated into the existing institutional framework provided by the city’s cycling club, the sport soon became too big and an independent football club was established in 1898. But it was in Vienna where football would truly make its mark. Fin de siècle Vienna was home to a sizable contingent of British diplomats, businessmen, and engineers who brought their sports with them to the continent. The first match in the Habsburg capital took place in 1894 between members of the Vienna Cricket Club and a team of Scottish gardeners of the Rothschild estate. In 1897 a cup competition open to all teams from the Austro-Hungarian Empire called Der Challenge Cup was created, though nearly all teams came from either Vienna, Budapest, or Prague. The game’s popularity skyrocketed. English clubs regularly toured the city; a 1905 match between Everton and Spurs drew a record crowd of 10,000 people. A Viennese football league was founded in 1911, and shortly before the outbreak of the First World War 20,000 fans attended a match between Austria and Hungary. Austria Wien were cut from an entirely different cloth. They were founded as Wiener Amateur by players and officials of the Vienna Football and Cricket Club and changed their name to Austria Wien after the professionalization of football. In stark contrast to Rapid, Austria became the team of the flourishing bourgeoisie who frequented coffeehouses to discuss politics, art, and, increasingly, football. The same article of Illustriertes Sportblatt referenced above describes the club as playing “salary football” clouded by “dense coffeehouse smog.” The coffeehouse was at the center of all things Austrian football and fans of all teams, not just those of the bourgeois Austria Wien, congregated in coffeehouses to socialize and discuss the affairs of their club. But Austria epitomized this coffeehouse culture associated with the intelligentsia, and were even headquartered in various coffeehouses of the Innere Stadt, Vienna’s historic city center. The dichotomy of the two Vienna clubs is summarized by the social scientist Roman Horak, who writes that “”If ‘SK Rapid’ stood for proletarian toughness and the suburb, then ‘Austria’ stood for the city, coffeehouse, and the liberal Jewish middle class.” It is somewhat ironic, then, that the hero of Austria Wien and of the Viennese bourgeoisie was of decidedly proletarian stock. Matěj Šindelář was born in 1903 in a small Moravian village into a family of modest means. His father was a bricklayer and his mother struggled to take care of their four children. In 1905 the family moved to Vienna and settled in the Favoriten district, a heavily industrialized area. He began playing football in the streets and quickly stood out out for his uncanny dribbling ability. After his father was killed on the Isonzo Front during the First World War, young Matthias, as he was known by then, began an apprenticeship as a locksmith. But his future was to lie in football, not in the gritty factories of the Vorstädte. In 1918 Sindelar joined the youth team of ASV Hertha, whose stadium was located next to his house in Favoriten. He played for Hertha while continuing his apprenticeship, and by the age of 18 he debuted with the senior team in the Austrian championship. An uncharacteristic forward with a slight physique and an aversion to physical play, Sindelar quickly earned the nickname Der Papierene, the Paper Man. In 1924 Hertha slid into a financial crisis and Sindelar signed for Austria Wien, then still known as Wiener Amateur. Within a season he broke into the first team. 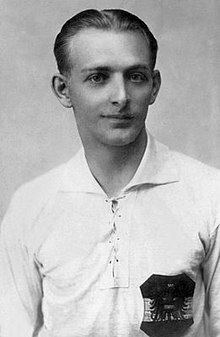 He was part of the side that won the league and cup double in 1926 and by 1927 was the club’s leading goalscorer, though Austria Wien dropped to a disappointing 7th in the league table and would not win another league title until after the Second World War. Sindelar earned his first international cap at 23 years old and promptly scored on his debut, a 2-1 friendly victory over Czechoslovakia. Despite playing well he soon fell out of favor with national team manager Hugo Meisl, a strict disciplinarian who, in spite of Sindelar’s obvious talents, favored a traditional center forward. For several years Sindelar couldn’t get a cap. Then, in 1931, a group of journalists purportedly confronted Meisl in Vienna’s Ring Café and demanded that he reinstate Sindelar into the side. Meisl relented and Sindelar started as an unconventional center forward in Austria’s next international fixture against Scotland. He was magnificent, and Scotland were swept aside 5-0 in a way that simply was not supposed to happen when the Home Nations went up against continental opposition. At that moment, the Wunderteam was born. With the unorthodox but incredibly talented Sindelar leading the line, the Austrian national team became a European footballing force. Germany were defeated 5-0 in Berlin and 6-0 in Vienna, with Sindelar scoring a hat trick in front of the home fans. He scored in an 8-1 victory over Switzerland and again in an 8-2 thrashing of Austria’s old imperial rival Hungary. Their fluid play earned them the nickname “the Danubian Whirl” and in 1932 they won the second edition of the International European Cup, a Central European international competition open to Austria, Hungary, Switzerland, Czechoslovakia, and Switzerland that was contested in a similar manner to the British Home Championship. Their true test was to come in December 1932, when the Wunderteam traveled to London to take on the mighty England. The English national team was, despite the proclamations of the media, hardly the standard bearer of the sport and had been beaten by continental teams on numerous occasions. But at home they retained a certain aura and were unbeaten on their own soil against foreign opposition. England won 4-3 at Stamford Bridge, but the Times awarded the Austrians the “moral victory.” The English papers raved about the intricate passing and fluid movement of the Wunderteam, with the Daily Mail calling their performance “a revelation.” Though they could not break the spell of English domestic invincibility – that task would be left to their spiritual successors, the Hungarians, two decades later – they gained plenty of admirers for their style of play. Sindelar was at the center of everything, and after the match against England he was reportedly offered a contract on the spot to sign for Arsenal, though like many of the tales surrounding the Paper Man it may well be apocryphal. Red Vienna may have been a bastion of liberalism and Social Democratic governance but it was hardly representative of the entire nation. The Christian Social Party dominated politics at the national level; every Chancellor of Austria in the 1920s was either a member of or governed in coalition with the party. But underneath this superficial stability the country was becoming more and more polarized. Paramilitary forced were organized by both the right and left. Tensions between the two escalated into a full blown crisis during the July Revolt of 1927, when a protest against the acquittal of three right-wing paramilitary members charged with the murder of a World War I veteran and a young boy resulted in the deaths of 89 people. Violence continued to escalate, and the fragile First Austrian Republic was unceremoniously dismantled in 1933 when Chancellor Engelbert Dollfuss took advantage of a loophole in the parliamentary voting procedures, dissolved the legislative assembly, and moved toward establishing a dictatorial regime. Cursory histories of twentieth century Europe focus on the Fascist triumvirate of Hitler, Mussolini, and Franco, ignoring similar developments elsewhere. 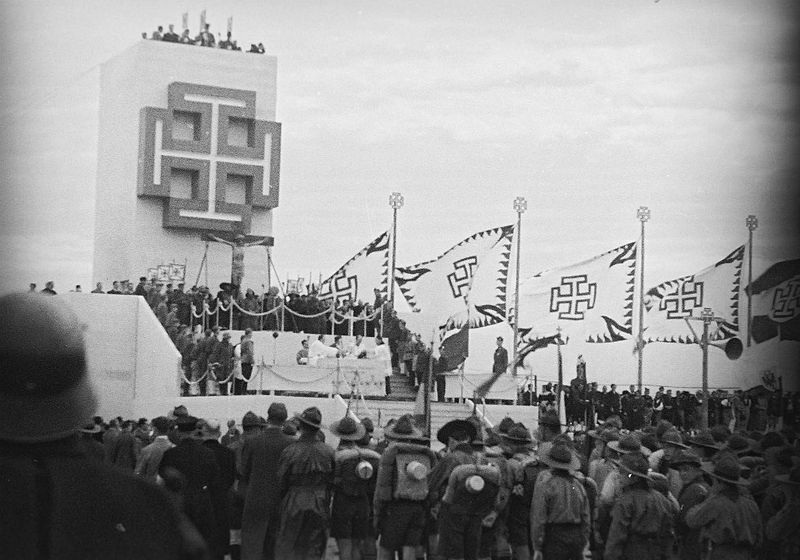 But interwar Europe witnessed the establishment of right-wing dictatorships in states as diverse as Portugal, Hungary, Romania, and of course Austria, which adopted its own peculiar version of the ideology that historians have since dubbed ‘Austrofascism.’ By May of 1934 Dollfuss, having emerged victorious in the Austrian Civil War, established a one-party state with all parties other than the Fatherland Front banned. While an explicitly anti-Nazi party with close links to the Roman Catholic Church and a strong opposition to unification with Germany, the iconography and aesthetics of the Fatherland Front clearly borrowed some elements from National Socialism (see image above). The symbolic death of Red Vienna came in the form of the destruction of the Karl Marx Hof, the public housing estate that was as a monument to the city’s socialist leanings. Red Vienna was no more. Political developments in Vienna inevitably affected the national selection. As David Goldblatt writes in The Ball is Round, “it was therefore a tired and troubled Wunderteam that arrived in Italy and it showed.” Their performances in the early matches were underwhelming. Extra time was needed to defeat the French in the first round and a narrow victory over Hungary in the quarterfinals ensured a semifinal date with hosts Italy. Austria was at a disadvantage before the match even kicked off. A swampy pitch following heavy rains hampered the style of the Austrians, who relied on quick, short passing. Furthermore, suspicion of referee favoritism toward the home side and even direct intervention by Mussolini himself put the integrity of the tournament into question. The BBC documentary Football and Fascism alleges that before the match Il Duce had dinner with the Swedish referee Ivan Elkind and instructed him to ensure an Italian victory. Elkind is said to have turned a blind eye to the blatant, incessant fouling of the Italians, and after a dismal 90 minutes during which the Austrians could barely even muster a shot on goal the Azzuri ran out 1-0 victors. It is all too tempting to draw a direct connection between internal political developments and the disappointing results of the national team at the 1934 World Cup. But the extent to which the tumultuous events on the home front affected their performances in Italy is an entirely speculative matter. Perhaps, as Jonathan Wilson suggest in Inverting the Pyramid, the Wunderteam was simply past its peak by 1934. Vittorio Pozzo’s legendary Italian side was less technical and less fluid than the Austrians but their tactical awareness and physical preparedness was second to none. Pozzo’s decision to have Mario Monti man mark Sindelar was a stroke of genius; the Paper Man’s influence in the semifinal was negligible. Though their victory in 1934 was stained by the allegations of corruption, they proved that it was no fluke by repeating as World Cup Champions in France four years later. But while there may be no direct link between politics and football results, the decline of the Wunderteam parallels the fate of the country. For both the Wunderteam and independent Austria, 1934 was the beginning of the end. After defeat against Italy in the semifinals Austria surprisingly lost 3-2 to Germany in the third place match. Two months later Dollfuss was assassinated by Austrian Nazis in response to his crackdown against the Nazi Party, whose popularity was rapidly rising. In the ensuing crisis, Italy’s support was essential in preventing Austria’s annexation by Germany. After the World Cup the previously invincible Austrians suffered friendly defeats against Hungary, Italy, and Poland, and on two occasions could only muster a draw with Czechoslovakia. A victory over England in Vienna in 1936 provided a cathartic moment, but by that points the Wunderteam, if it could even be called that, was in an irreversible decline. In both football and geopolitics Austria was being outmaneuvered by its more powerful neighbors. 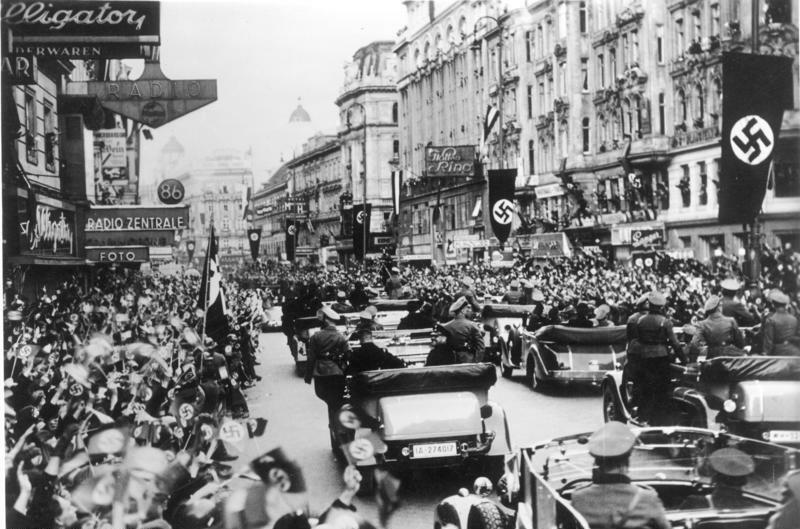 On March 12, 1938, German troops triumphantly entered Austria. Cheering crowds greeted the Nazis in Vienna, and 200,000 gathered at Vienna’s Heidenplatz on March 15 to hear Hitler proclaim the incorporation of Germany’s eastern province into the Third Reich. This time, there would be no Italian diplomatic intervention on behalf of Austria. Fatherland Front politicians were powerless in the face of German panzers. An independent Austrian state ceased to exist. But these incidents should not be interpreted as being emblematic of a wider pattern of resistance. The Anschluss match was not the catalyst for an anti-Nazi movement, but “a swansong for the great Viennese football culture and the fragile metropolitan social ecology that had sustained it.” 99.7% of the Austrian population voted in favor of Anschluss, and though these figures are obviously inflated in general most Austrians were in favor of union with Germany. Viennese football culture was destroyed. Hakoah, Vienna’s Jewish club, was immediately disbanded. Other clubs with significant numbers of Jewish members and officials, FK Austria among them, also faced the wrath of the Nazis. Though powerful in its symbolism, Sindelar’s act of defiance was a fleeting gesture, Austria’s last moment of pride before it was turned into Ostmark, the Eastern realm of the Third Reich. As for Sindelar himself, the Anschluss match was the last time he ever played football. Already 35 and with bad knees, he refused the entreaties of Sepp Herberger to turn out for the new, combined national team. It is doubtful that his presence would have made much of a difference. Herberger was under strict orders for the national team to be composed of six Germans and five Austrians or vice versa for every match. Theoretically combining two of the best teams of the era should have yielded fantastic results, but in reality the tensions between the two sets of players and the differences in their playing styles were too much to overcome in such a short period of time. At the 1938 World Cup in France, Germany only managed a 1-1 draw with Switzerland and was embarrassingly eliminated after a 4-2 defeat in the replay. Sindelar quietly retired to a civilian life. He purchased a café from a Jewish man who was forced to give it up because of the new anti-Semitic laws and settled into his new life as a coffeehouse owner. On the night of January 22, after a night of heavy drinking and gambling, Sindelar returned to his apartment with his girlfriend. The next morning, after he was nowhere to be found, his friend Gustav Hartmann broke down his door and found him naked and dead.